Starting tomorrow, April 1, 2019, the Jakarta's Integrated Moda Raya (MRT) transportation will operate commercially. During the first month, its fares will be discounted by 50 percent.
" Based on the actual fares, Lebak Bulus towards HI Roundabout is Rp 14,000 and will be cut at Rp 7,000 per trip, for instance from Dukuh Atas to Fatmawati which should be Rp 12,000, become Rp 6,000"
"Jakarta Provincial Government along with City Council (DPRD) has set MRT fare based on Governor Regulation No. 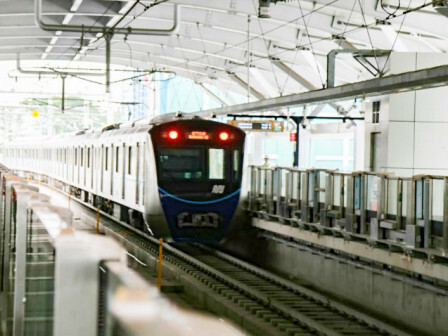 34/2019 on Transport Fares fo MRT and LRT," said Jakarta Governor Anies Baswedan, Sunday (3/31). But for the first month operation, they (MRT) made a 50-percent discount proposal in a bid to attract more passengers and intensify MRT socialization. "Based on the actual fares, Lebak Bulus towards HI Roundabout is Rp 14,000 and will be cut at Rp 7,000 per trip, for instance from Dukuh Atas to Fatmawati which should be Rp 12,000, become Rp 6,000," he explained. Then from HI Roundabout to Dukuh Atas, which should be Rp 3,000, become Rp 1,500. He hoped that it could provide more space for the community to use the MRT and encourage them to choose public transportation than private vehicle. As for the information, the MRT operational will start at 5.30 AM from Lebak Bulus Station and Blok M Station towards HI Roundabout Station. While from HI Roundabout Station towards Lebak Bulus Station, train car will leave at 5.36 AM and continued every 10 minutes for the next train.